A masterpiece of informative literature. What did you like most about Heretic? I thought I had an open mind on Islam before listening to this book, but I was soon overwhelmed by my own misinterpretations. 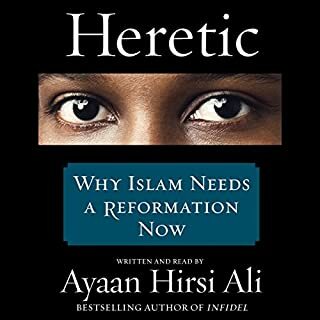 Ayaan Hirsi Ali offers a whole new take on political correctness and how western liberals are involuntarily failing the muslim world by undermining the essential link between violence and the Holy texts of the Quran. My heart goes out to Muslim dissidents like Ayaan Hirsi Ali who put their life on the line to help others under religious oppression. A must read for anyone who welcomes having their mind split open.